In hour 1 of this series we learnt to get started with AngularJS. In this hour we will see Angular Templates and how AngularJS app can be embraced into a pattern. Let us start with writing a simple web application with static template. 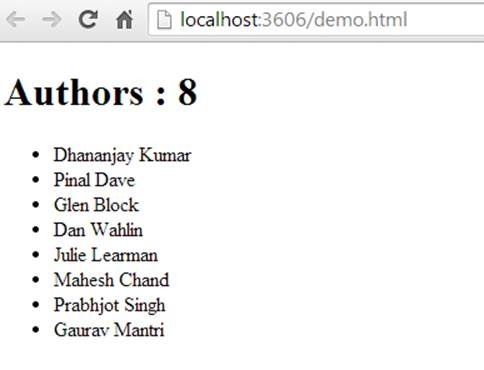 In below application we are printing name of the authors in HTML unordered list. We will get application rendered as below and authors are printed in HTML using static template. Below rendered page is pure static HTML page. In first line we are creating Module. In second line we are creating Controller. Controller is a function which takes $scope as parameter. Then adding authors JOSN array in scope of the controller. This is Model. In Angular Controller is a constructor function that takes $scope parameter. Once we have Controller in place we will have to create View. View simply displays model through templates. View and Template get created in HTML. We will bind View with Controller and Angular will project data from Model on the View. On the View we are using various Angular directives. 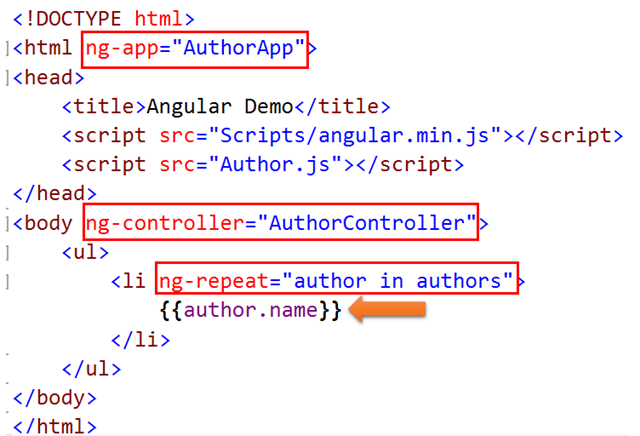 In first step we did Scope declaration by setting ng-app directive to Angular module name. Now any element inside this body can bind to array of controller. In next hours we will get into other aspects of AngularJS. All the images are missing.Please provide the images.